Thank you for visiting Noskidsafety.ca. One 8 oz. bottle slip treats two tubs or up to 25 sq. ft. of shower tile. NFSI Certified High Traction. This tape color & wording draws visual attention to areas that might require additional caution. NFSI Certified High Traction. In stock, quick ship. Order online. Premium high traction series that helps to ensure an OSHA compliant environment but die cut in convenient 6"X24" pieces. Includes an added photoluminescent stripe on each piece. 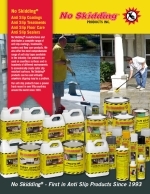 A long lasting and chemical resistant product used around the world in OEM applications requiring a consistent, reliable excellent quality anti slip product. NS5200B black grit tape, our durable, premium high traction silicon carbide grit tape helps to ensure an OSHA compliant environment. NFSI certified for "High Traction" and meets Prop 65, ADA, and OSHA standards. It is manufactured from a cross-linked polyolefin, more durable than conventional PVC vinyl and is embedded with an aggressive 80 grit silicon carbide stone that won't wear down and round off as rapidly as competitors' products. Manufactured from a cross-linked polyolefin, more durable than conventional PVC vinyl and is embedded with an aggressive 80 grit silicon carbide stone that won't wear down and round off as rapidly as competitors' products. Suitable for industrial areas, ramps, dock areas, boat decks, walkways, stairwells, work areas, machine shops, industrial equipment, trucks & trailers, and many OEM applications. NFSI certified for "High Traction"& meets Prop 65, ADA, and OSHA standards. Our durable, premium high traction series helps to ensure an OSHA compliant environment. Die cut in convenient 6"X24" pieces with aggressive PSA adhesive system. Certified High Traction by the NFSI. This product is part of our premium high traction series that helps to ensure an OSHA compliant environment but die cut in convenient 6"X24" pieces. Includes an added reflective stripe on each piece. Certified High Traction by NFSI. 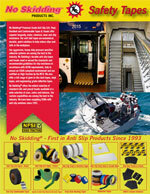 Edge sealer protects exposed edges of slip-resistant tapes and treads from excessive moisture or liquids. One 5-ounce tube with convenient tube applicator seals approximately 75 to 100 linear feet.